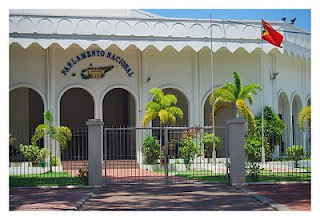 Thirty-two percent of newly inducted Members of Parliament are women Radio Timor-Leste, July 31, 2012- President of the National Parliament Fernando Lasama yesterday officially inducted 65 new parliamentary members in the House of the Parliament. The new MPs are comprised of 30 from CNRT, 25 from Fretilin, 8 from the Democratic Party (PD) two from Frenti Mudanca two. This week the MPs will elect their new parliamentary president and vice president who will be inducted by the president of the republic. Of the 65 newly-elected Members of Parliament, 44 are men and 21 are women with 9 women in CNRT, 8 in Fretilin and 2 from PD. Both FM members are men. The women's representation in the Parliament is 32 per cent. Radio Timor-Leste reported today that Maria Paixao, the former Member of Parliament and Deputy Parliamentary President (Speaker), has called on the new MPs to elect one woman to become the deputy president of the National Parliament. Ms. Paixao made the comments yesterday after the ceremony for the induction of the news MPs in the House of the Parliament. She said it was very important to elect a woman as the deputy president to influence decision-making that would benefit the Timorese women's interest. Paixao also called on the Parliament to set up a stronge and united parliamentary women's group to help support the women in the various sectors. Fretilin denies rumors on joining new government Diario Nacional, July 31, 2012- Fretilin party Secretary-General Mari Alkatiri has denied rumor mongering that his party members will take part in the new government. Mr. Alkatiri said the information on taking part in the new government was only a rumor and was untrue. "There are many rumours in our country. People do not believe factual information, but they prefer believing rumors," he said. He said Fretilin was open to dialog in order to contribute to stability and development. Police identify illegal gambling sites Diario Nacional, July 31, 2012 - `The National Police (PNTL) have identified illegal gambling sites in the Capital of Dili, PNTL Operational Commander, Armando Monteiro said. PNTL's intelligence service was also studying information on the illegal activities, so that the police could take the necessary action against them," he said. "PNTL has the information now and the intelligence service is still studying it and this is illegal gambling," he said. The Government decided to close down all kinds of gambling in the country as gambling constituted an act of crime. Lasama calls on new parliament to approve pending laws Diario Nacional, July 31, 2012 - The President of the National Parliament, Fernando Lasama Araujo has called on the new parliament to debate and approve several laws which were still pending at the end of the last Legislature before the election in July. "I am calling on our friends, the new MPs, to debate and approve some laws which are still being pending," he said. Mr. Lasama affirmed that those laws were pended as everything should follow the procedures and the process. He added that the law for veterans was very important to be discussed as many veterans had not yet been paid. Government to set up operational military centre in Dili Independente, July 31, 2012 - This year the Government will set up an operational military centre for the Timorese Defense Force (F-FDTL) in Hudi-Laran in Dili, State Secretary for Defence, Julio Thomas Pinto has said. The establishment of this centre would incude a communications unit, the naval force, and air and ground forces, he said. Mr. Pinto said this military centre would make the new government to work hard; therefore he called F-FDTL commanders to have good coordination with the new government. He added that this plan was very important for the defence force to consolidate all the components and units within F-FDTL. Situation in Viqueque under control Suara Timor-Leste July 31, 2012 - Viqueque District Police operational Commander Superintendent Antonio Monteiro said the Timorese National Police (PNTL) had detained 14 suspects who are suspected of being involved in the recent criminal acticity in the District. The police detained three suspects in Lospalos and 11 in the capital, Dili. Monteiro said the 14 suspects were detained for investigation purposes. He added the situation in Viqueque district had returned to normal in which the people were now living in a stable environment and said the general command had deployed the Public Order Battalion (BOP) to provide security in the area. "We have identified the suspects who were involved in destroying the Uatulari Sub District police office building and we are now waiting for the Public Prosecution to hold its investigation into the case," he said.